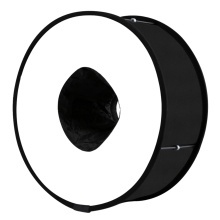 Softbox round design, made of excellent softlight fabric, provide translucent effect, with large illumination area, even if portrait photography can also covered fully, and make out eye expression light. Diffusion material effectively spreads light evenly on your subject, preventing harsh shadows. With its elastic band, you can install or uninstall it easily. It is foldable, thus you can fold and unfold it, and bring it with you wherever and whenever you need. Soften light stream and remove shadow to make perfect shooting.